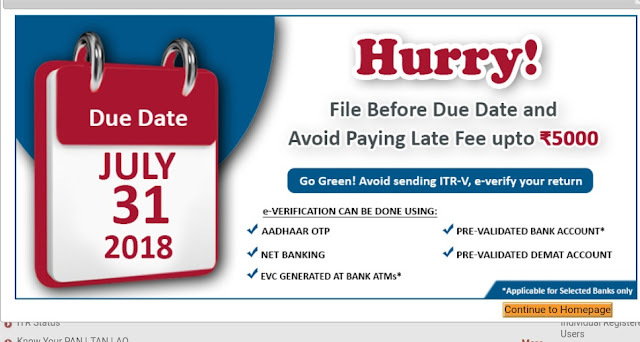 Income tax return online Submission deadline 31st July 2018 No Due Date Extension for filling Income Tax as per CIRCULAR No.4/2018 F.No.370889/25/2018/No Due Date Extension for filling Income Tax Last Date on 31st July 2018 as per CIRCULAR No.4/2018 F.No.370889/25/2018. CBDT – extension in due date for non-tax audit cases is fake and there are no such plans to extend this deadline beyond 31st July, 2018 as per CIRCULAR No.4/2018 F.No.370889/25/2018. No Due Date Extension for filling Income Tax Last Date on 31st July 2018 as per CIRCULAR No.4/2018 F.No.370889/25/2018. Department of Revenue Central Board of Direct Taxes, New Delhi, Dated 21st July, 2018. This Circular is issued in pursuant to 139(1) of the Tax Act, 1961 is to clarify that rumors spreading across in media regarding extension in due date for non-tax audit is fake and no such plans to extend this deadline beyond 31st July, 2018. The department already received over 1 crore returns filed electronically.